This week's #SundayFunday topic is Warm-Ups and Closures. I know firsthand the chaos that ensues when you don't have well-established start-of-class procedures. Something I have found helpful is to give my students the same type of warm-up on certain days each week. I pick a topic that is usually a review of material related to what we are currently studying. I've also considered spiraling. Students write, draw a picture, give an example, list common misconceptions, and make observations about the topic on the "My Ideas" side. Sometimes I write questions to help guide their thinking for those reluctant to write anything down. We take a few minutes to share as a class and students add to the "Class Ideas" side. Students practice the skill on 3-6 problems. Students are given a prompt and are required to answer in complete sentences. 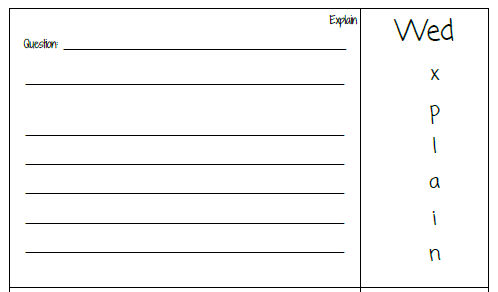 Examples of questions include: explaining how, explaining the difference, giving step-by-step directions to solving one of Tuesday's problems, etc. The type of question changes every week. Examples include: find and fix the error, compare and contrast, solve/write a word problem, which one doesn't belong, reflect on your understanding, etc. I recently edited the file to no longer include Friday's reflection; I include reflection on Thursdays every so often. I like to use Estimation180 or Which One Doesn't Belong? on Fridays or use the end of the week as a make-up day for the times we don't have a full week of school. Sample topics include: operations with fractions, decimals, integer operations, LCM, GCF, equivalence, solving equations, area, perimeter, volume, squares and square roots, powers of ten, exponents, rate of change, slope, linear vs. nonlinear, coordinate plane, etc. At some point during the year (I typically do it the last month of school), we do character-driven Do Now's. So we cover mindfulness, identity, challenges, and sharing successes over the course of four weeks. 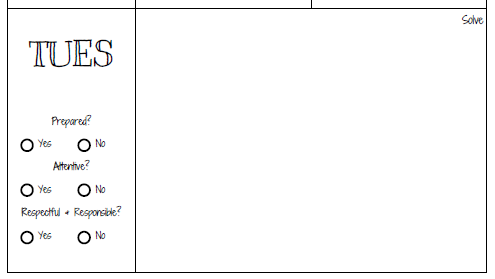 There is also a behavior management self-check for each day on the Do Now paper. I have posters in my room that ask students, "Were you up to PAR in class today?" PAR stands for Prepared, Attentive, and Respectful & Responsible. The posters list examples of expected behaviors in each category. These expectations are also listed on the Do Now divider tab in students' notebooks. 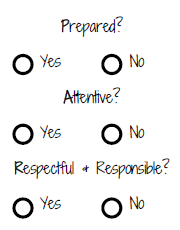 At the end of class, students check off "yes" or "no" for each category. 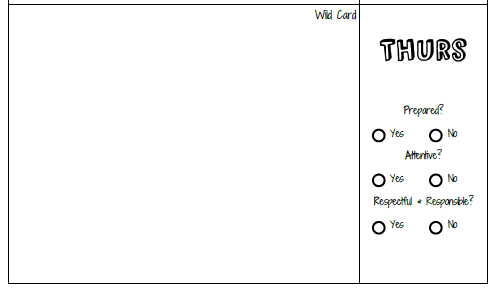 I don't grade this self-assessment; I just want students to be aware of their own behaviors and start to recognize patterns in their behavior. The Do Now sheets are sized to fit in an INB pocket. I used to have students tape their Do Now's in their notebook, but then I had to collect nearly 100 notebooks every week to grade. This year there are double-sided pockets for each quarter in the Do Now section of students' notebooks. We keep our current Do Now in the front pocket and graded Do Now's in the back pocket. This year students just take the sheet out of the pocket at the end of the week to pass it in, instead of the entire notebook. Depending on the day, I aim to spend 5-10 minutes on the Do Now. This doesn't always go as planned, and I have had classes that were so dependent on me to answer the Do Now questions that I had to scrap this routine entirely and give them basic math facts to start class so that I could take attendance without stopping every two names to tell students to stop talking, sit in their seat, and begin the Do Now. Establishing routines is something I am still working on. 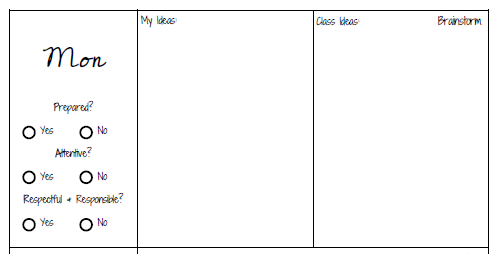 I have a Do Now template that I print out and then hand-write the topic and questions for each week before making copies. If you are interested in using my file, be sure to set your printer to "Top Bind" or "Flip on Long Edge" when you print double-sided so that both sides appear right-side up and on the same half of the paper. 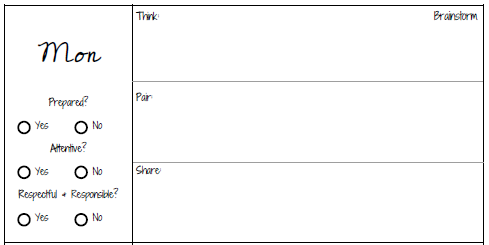 UPDATE 10/21/2017: Since our department is focusing on students using Think-Pair-Share this year, I have updated Monday's Brainstorm boxes to include space for students to document ideas during each stage of that thought process. Both the original and updated files are available below.